There are lots of ways to organize coupons; the key is to find the approach that works best for you and sticking with it. Organizing your coupons at first may take a lot of your time, but once you get used to your method it becomes faster and easier. Develop a filing system. Most couponers organize their coupons by category (dairy, frozen foods, deli, etc.) or by expiration date, but it’s not the only way to go. 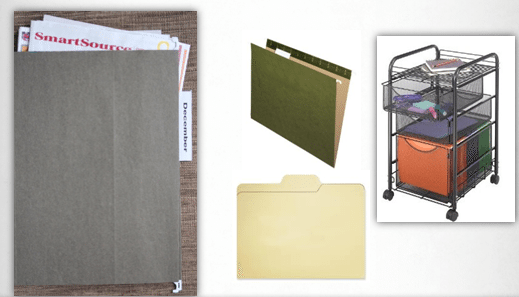 Find a filing system that works for you, organize by aisle, by expiration, or category etc. At first, you will be busy with organizing, but once you are done it will really make couponing easier. Find a container to hold your coupons. Use a shoebox, a storage container, a coupon binder, a coupon wallet or a recipe box. It really doesn’t matter what you choose. The most important thing is to have a landing spot for all of your coupons. Purge regularly. Expired coupons won’t save you money, so don’t let them hog space in your coupon file. Set a schedule for purging expired coupons, and stick to it. When they reach their expiration date pull them out of the cycle. Have you ever heard the joke? “If you see a binder, don’t get behind her”. I laugh because I too have had many people roll their eyes at me, but the joke is on them. Especially, when they turn around in amazement over the HUGE savings. 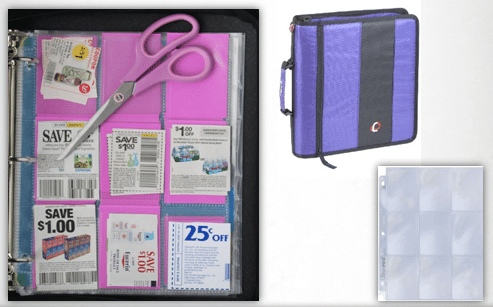 The general idea with the binder method is that you shop with all of your coupons in the binder. I also recommend a good quality binder, preferably one that zips up like the one pictured here (Amazon link). Each week, clip your coupons from the Sunday newspaper, all of your magazines and any printable coupon sites (Like Coupons.com found on Inspiring Savings). Pull your coupons each week as you plan your shopping trip. Set them to the side or place them in a section of your binder with your shopping list so you can quickly refer to them in the store and pay at the register. This is the quickest filing method. However, beware with this method that even though you are filing your coupons at lightning speed you are saving all the work until you make your list. I like to refer to this method as “This is the do the work later method”. You will file your inserts by date (weekly or monthly) and cut coupons only when needed. 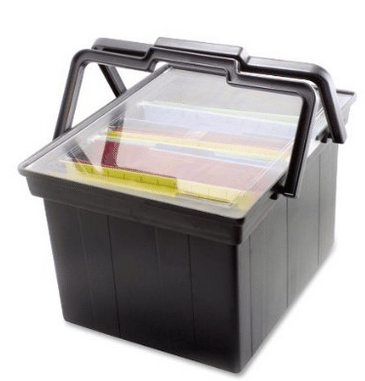 You don’t need a fancy file system like the one seen above, in fact, you can use this Plastic File Box, Includes Lid and Handles (Amazon Link) I really like this one because it is very portable. This is my least favorite method of filing. I just don’t like having all that paper in my hands or all over the desk when trying to do my list. I also don’t like keeping expired coupons with current coupons. The likelihood of pulling a coupon that is no longer valid is much higher. Nothing stinks more than heading to the register and being denied use of a coupon due expiration. Put the date on the front of the whole coupon insert. File your inserts by the week or month in file folders. Clip your coupons each week as you plan your shopping trip. Set them to the side or place them in an envelope so you are prepared when you are shopping and paying. Shop with your shopping list and clipped coupons. Discard inserts when the majority of the coupons are expired. File inserts by DATE and cut coupons when needed. You can then access the coupon database to find the coupons you need to clip before you shop or follow allow any one of my coupon match ups. Each store match up will list all the details you need to find your organized coupons. The hybrid method combines the use of two different systems; similar to the “binder” method and the “file insert” method. Cutting some coupons and filing others. 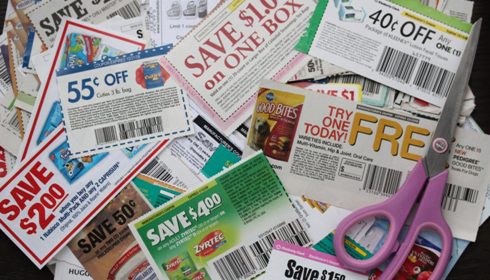 Cutting all coupons that pertain to the brands that you purchase on a regular basis, that are higher value or will expire quickly (usually within a 2-week time frame) all stay in the coupon portfolio. I also, like to carry around extra coupons in case I spot an unadvertised sale or clearance opportunity. You can either clip the remaining coupon (which is what I do) and file them in your binder or file them by using the “file insert” method. 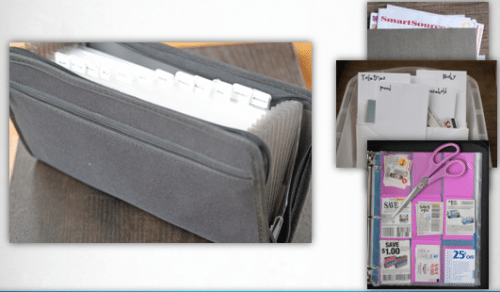 Here’s one example of a super cute coupon organizer I found on Amazon. It’s neat and tidy and fits perfectly into your purse. One method I’m seeing used more and more is the coupon box. It is the cheapest way to organize. No need to purchase any special binders or filing accessories. 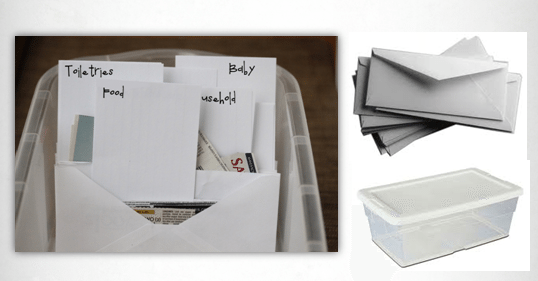 Simply use a plastic or cardboard shoe box, envelopes and index cards to create a simple and inexpensive file system. Add coupons to envelopes with index cards stapled to them with printed or written labels. Keep in a small plastic box or shoebox. If you’re interested in trying this method, I found a Snapware Smart Store System on Amazon with many different sizes of boxes. If you don’t already have a container to use for organizing. I personally organize by using a coupon binder and personalized my method with a small spin on the hybrid method. I am a planner, so I always take a detailed list to the store with me. In my binder, I have tabs for each month and I have organized by expiration date. It took me a while to get organized, but when I did it made all the difference. Whatever method you choose to use make sure it works for you and stick with it. Organization is key when it comes to staying on top of your store’s deals.